The Clare Benedict Collection of Constance Fenimore Woolson Memorabilia at Rollins College in Winter Park, Florida, contains many of Woolson’s books and some manuscripts. The descriptive catalog of the collection is available here. Although Constance Fenimore Woolson often noted her desire to return to Florida, she was unable to fulfill her wish. 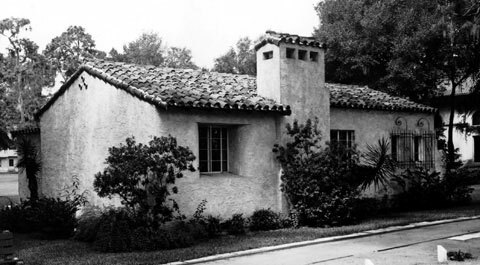 To honor her desire and to create a worthy monument to the memory of her aunt, Woolson’s niece and executrix, Clare Benedict, gave to Rollins College in Winter Park, Florida, a building furnished with items from Woolson’s estate, including some of her books and manuscripts. Woolson House opened with ceremony on May 31, 1938, and Fred Lewis Pattee gave the dedicatory address. It was Clare Benedict’s hope that Woolson House be used as a gathering place for aspiring and accomplished writers. She endowed her generous gift with a fund to ensure its upkeep, but her wishes were not always respected by the English Department which had been charged with care of Woolson House. Security was often lax and many of the documents, photographs, books, manuscripts, and tableware disappeared. In 1992, the Department of Archives and Special Collections removed what remained and stored it in the archival vault. Woolson’s desk, which had fallen into disrepair, was restored through the generosity of Rollins alumna Carolyn VanBergen Rylander, Ph.D. and is now a showpiece in the Special Collections Room. In the early 1990s Rollins College renovated Woolson House and it is now used as an English Department faculty lounge, although other groups may use the building upon request. Most of the books from Woolson’s library are still on hand, as are some of her manuscripts and selections from her Notebooks, previously published by Clare Benedict in Constance Fenimore Woolson (London 1932). The manuscripts for “The Story of Hepzibah,” which was unpublished at the time of Woolson’s death, and the last page of Horace Chase were lost during the years when the collection was unsupervised. One of the Collection’s prized possessions is a set of caricatures drawn for “Plum” and titled “Visiting in Asheville,” and the manuscripts of Woolson’s fern poems, penciled in Chapman’s Flora of The Southern United States (New York, 1872). The Archives also has the Benedict Papers, which consist of the correspondence of Clare Benedict with Rollins College officials and a copy of her will stipulating the terms of the endowment. The Woolson materials are available to scholars by appointment only. Interested persons should contact the Department of Archives and Special Collections, which is open Monday through Friday from 8:00 a.m. to 4:00 p.m. The Woolson Collection is not available for interlibrary loan.